Casio Computer Co. Ltd., Japan. Casio was an early manufacturer of calculators electric and electronic calculators. It produced electric relay calculators in the 1950s and early 1960s and transistorised desktop calculators in the mid 1960s. Casio pioneered low-cost hand-held electronic calculators in the early 1970s with the Casio Mini, and by producing well specified, high-quality calculators survived the calculator price wars of the mid-1970s and continues to be a major calculator manufacturer today. In 1946 Kashio Tadao (who had been born in 1917) set up his own business called Kashio Seisakujo, in Mitaka, Tokyo, Japan. The company operated as a small subcontractor that made microscope parts and gears. However, in looking for products to manufacture, Tadao with one of his brothers, Toshio, developed a four-function mechanical calculator. From this followed the relay calculators and then the transistorised calculators. 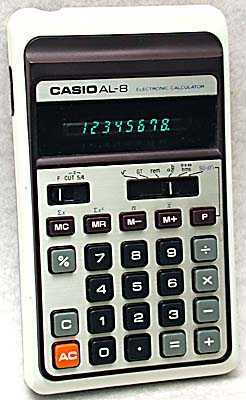 The Casio Computer Co., Ltd. was established on June 1, 1957 to develop and manufacture the relay calculators. The whole fascinating story of Casio and its calculators is told at http://world.casio.com/corporate/history/. A brief chronology of Casio products can be found at http://world.casio.com/corporate/history/chronology/. Jun. 1957 - Casio 14-A, all-electric compact relay calculator. Sep. 1965 - Casio 001, electronic desktop calculator with onboard memory. Oct. 1967 - Casio AL-1000, programmable desktop electronic calculator. Aug. 1972 - Casio Mini, affordable hand-held calculator. May 1974 - Casio fx-10, scientific hand-held calculator. Dec. 1976 - Casio CQ-1, first combined hand-held calculator & clock. 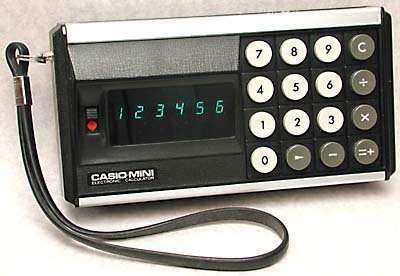 Jan. 1978 - Casio Mini Card, first credit card-sized calculator (3.9 mm thick). This is an early programmable calculator, and uses discrete transistors and a magnetic core memory. It dates from 1967. When launched in 1972 the Casio Mini was one of the cheapest electronic calculators, costing just below US$100.00 [£40.00 Sterling]. Ways of achieving this are the use of only a 6-digit display, and no decimal point key. There followed several more Mini models, with improved specifications. Together with the Casio AL-10, it was the first calculator able input fractions. This was the first combined hand-held calculator & clock/stopwatch, introduced in 1976. Introduced in 1978, this was the first credit card sized calculator. For further photographs of Casio calculators see the Calculator Photo Library on this site.